I saw some tweets about a truck full of bees that over-turned in Utah, but I can’t find any pictures. I understand that people were getting stung, but come on. There’s no one nearby with a camera out there?? Which reminds me, I have a couple of YouTube videos I wanted to post. A lovely film from Occupy Wall Street of muslims using the people’s mic in a nice way. For Bones fans, outtakes [the video I linked to has since been removed]. 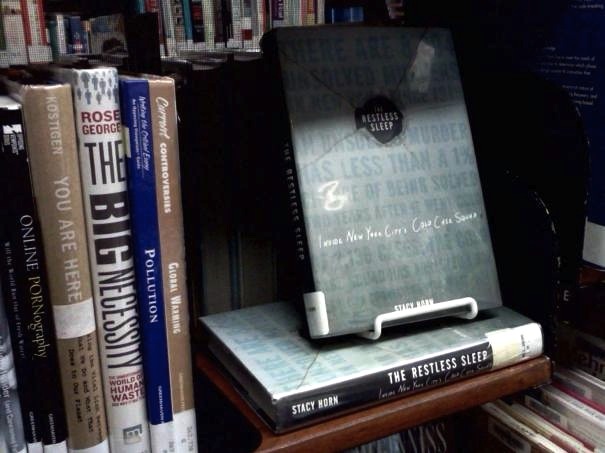 This is one of my books (The Restless Sleep) at a library in the East Village, (the Ottendorfer, at 2nd Avenue and St. Mark’s). Thank you, New York Public Library and Ottendorfer librarians!